Professionals who have shared and practised different ways of performing the key management and leadership functions offer increased self-awareness, flexibility and confidence. They are better able to stand back from the everyday detail and focus on longer-term organisational needs, secure in the knowledge that their team are competent and motivated to deal with operational tasks. Participants on PROCLAD Academy’s People Management & Team Leadership Masterclass training course will be exposed to a range of different approaches to management and leadership practice, allowing them to select those most suitable for their situation and personal style. The opportunity to experiment with key techniques before applying them in the workplace will help build the confidence to move beyond traditional assumptions about the ‘right’ way to manage. 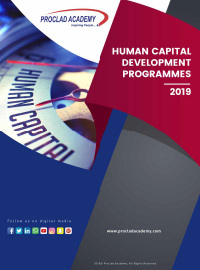 PROCLAD Academy’s People Management & Team Leadership Masterclass training course uses a range of approaches to learning, including experiential group activities, individual exercises, mini-case studies, role plays and syndicate discussions. A key part of the learning process is sharing the differing experiences participants bring, as well as experimenting with novel – and sometimes challenging – techniques. Leader or manager? Why does it matter?